Home » Latest News » What aN ICE Idea. Our Wedding Ice Sculptures can include elegant swans, flamingos, love hearts, love birds, leaping dolphins, bride and groom sculptures, wedding carriages or whatever your heart desires. Ice sculptures shine like diamonds in hall entryways and patios to greet guests upon their arrival and leave a lasting impression. 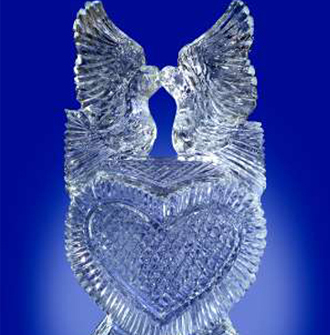 Professional hand carved ice sculptures can be provided to make your event one that will be remembered.